Our "bio chic bon genre" style comes back this season for our children's dolls! 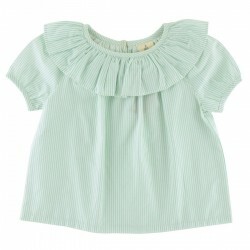 They will love combining their green-stripped outfit with their doll's... irresistible! Doll dress with long sleeves and ruffled collar. Organic cotton certified to GOTS. Also available in printed plumetis and terracotta stripes. Suitable for dolls about 30-35 cm high.